Grady Hendrix is on a roll. His previous novel, Horrorstör (2014), was a contemporary spin on the haunted house tale, injecting all of the classic trappings and tropes into the gaudy expanse of an Ikea-like furniture store, with the book itself printed to resemble an illustrated store catalogue. With My Best Friend’s Exorcism, he takes things in all new directions in terms of story, setting, and aesthetic presentation. In 1988, two teenaged girls’ friendship is threatened when one of them becomes possessed by a demonic entity—all told between the covers of a high school yearbook, complete with endpaper photos full of grinning students. Abby Rivers and Gretchen Lang, students in Albemarle Academy of South Carolina, have been best friends for a long time. One night, during a party with some friends in the woods, Gretchen drops acid, then goes missing for a few hours—only to be found huddling naked and delirious inside of a creepy, burnt-out shack. In the days that follow, she begins to grow paranoid and twitchy, suspecting that other students are behind of the phantom whispers and touches she’s increasingly receiving. Her behavior, along with her hygiene, only all-too-quickly escalates into stranger and more unwholesome levels, as the familiar symptoms of demonic possession begin to occur. Will Abby and Gretchen’s friendship be enough to help defeat the invasive entity, or will the forces of darkness tear them apart—in more ways than one? As with the haunted-store setting of Horrorstör, this novel’s reimagining of the possession tale in an ’80s high school is far more than a gimmick. Hendrix stylishly delivers the scenario with humorous and ghoulish aplomb, with the scares often creeping out at the most unexpected of times, culminating in a few truly macabre scenes, including a sequence that may leave some readers never wishing to touch a milkshake again. 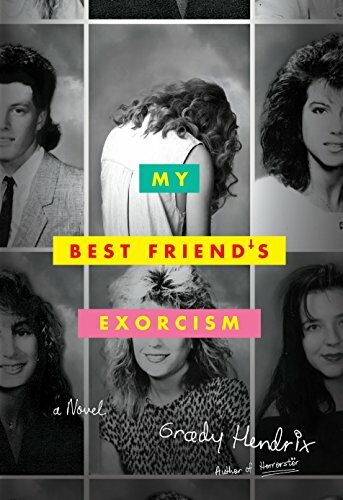 My Best Friend’s Exorcism is somewhat slow to begin, as the first couple of chapters are dedicated to Abby and Gretchen’s initial meeting and the formative years of their friendship. There are also a few instances of somewhat heavy-handed foreshadowing (usually at the ends of certain chapters) which fortunately do not spoil the subsequent surprises—of which there are a few. There are some truly affecting moments of pathos between the characters, illustrated with an all-too-real anguish that any suburban high-school survivor would know all too well. And very much in the paranoid early years of the War on Drugs, concerned parents (along with the staff and faculty of Albemarle Academy) provide more antagonism for Abby and Gretchen than even the demonic entity slowly rearing its ugly, metaphysical head between them. One of the most powerful aspects of the novel is its distinctly ’80s backdrop. Big hair and bright clothes, TCBY and trapper keepers, Gerry Ferraro and Duran Duran—the references are plentiful and appropriate, but not overdone to the point that they feel like sledgehammer nostalgia. As an additional (and deliberately quirky) touch, all the chapters are named after song titles, some of which are very cleverly utilized, such as “Parents Just Don’t Understand,” “Sunday Bloody Sunday,” and even “The Number of the Beast,” suggesting a fittingly quirky accompanying soundtrack. Along with last year’s bestseller A Head Full of Ghosts by Paul Tremblay, My Best Friend’s Exorcism marks a diabolically gleeful (and wholly original) entry in something of a new wave of possession tales. Proudly wearing its bloody heart on its rayon sleeve, this nostalgic tale of teen angst, friendship, and unholy possession is as surprisingly touching as it is grisly, making for one of the most unique reads of 2016.